Barbara Mittler. A Continuous Revolution: Making Sense of Cultural Revolution Culture. Cambridge, MA: Harvard University Asia Center, 2012. 502 pp. ISBN 9780674065819 (cloth). Accompanying website: A Continuous Revolution. What Han’s essay was responding to, of course, was/is the fact that the Cultural Revolution has remained lodged in a familiar auto-reflexive mode of representation that has not contributed to a better understanding of the movement. Indeed, since Deng Xiaoping’s rise to power in 1978 amidst an outpouring of grievances against the Cultural Revolution and the “Gang of Four” by both the Party and cultural elites, and against the backdrop of the masses wearied by the hyper-politicization of everyday life, the Cultural Revolution has continued to be identified as a “ten-year turmoil” and/or as an irrational revolution that (ironically) brought an end to the revolution. Additionally, both inside and outside of China, the Cultural Revolution has been likened to—often without any rigorous argument or appropriate evidence—Nazi Germany, racist America, Soviet Gulags, “feudal” Chinese court intrigues, traditional “Chinese cruelty,” and so on. Combined, these “standards” have functioned as the default lens through which the Cultural Revolution is filtered and viewed the moment it is mentioned, be it in popular, journalistic, or scholarly writings. The effect is not only the head-shaking incomprehension mentioned by Han Shaogong, but also the deng xia hei (灯下黑) effect that renders invisible “the spot right underneath the light” (and beyond). Nevertheless, in recent years—especially in the last decade or so—various aspects of that invisible spot have been illuminated in scholarship exploring the many complex social-cultural experiences, events, and groups that lie outside that paradigm of violence, cruelty, and chaos dominating the discourse on the Cultural Revolution. One of the latest among these attempts is Barbara Mittler’s hefty A Continuous Revolution: Making Sense of the Cultural Revolution Culture, a book that aims at a kind of “comprehension by reason.” It does so by refocusing on some of the familiar cultural phenomena—model operas and posters, for example—associated mainly with the Cultural Revolution, uncovering and exploring their connection with the much longer history of revolution in China, and how they were created and experienced by urban and educated (but mostly ordinary) Chinese, all for the purpose of “making sense” of the extent to which Cultural Revolution culture was part of a “continuous revolution.” As culture, the author argues, the Cultural Revolution continues to manifest itself in post-revolutionary China in unexpected ways, and for this reason it calls for continuing analysis and greater degrees of sense making. Mittler’s study reflects a tremendous amount of scholarly preparation. In addition to archival, primary, and scholarly materials that amount to forty-odd pages of “works cited,” the author also interviewed forty individuals (mostly urbanites with educated backgrounds) who had first-hand experience of the Cultural Revolution. Judging from the questionnaires prepared for the interviews and the long list of questions found throughout the chapters, one can clearly sense that the author genuinely wants to know—to “comprehend by reason”—and makes concerted efforts to gather evidence and constitute new modes of understanding the Cultural Revolution. Two of the key questions Mittler asks and sets out to explore in this volume are: Why are there so many “fissures and discrepancies within and between different memories” about the Cultural Revolution (5)? And, How does one make sense of the “multifaceted experience of the Cultural Revolution” (5)? It is the differences, contradictions, and multifacetedness of the Cultural Revolution that attracted the author. “By scrutinizing both the material evidence and the lived experience of Cultural Revolution Culture,” the author states, “this book intends to complicate our view of this intensely complex and immensely important period in Chinese history. It argues for a more comprehensive view of the Cultural Revolution that acknowledges its horrors and its pleasures, both its dictatorial and its democratic natures” (5). The result is a book with a rich array of well-researched materials, meticulously examined and explored against the historical context of twentieth-century China’s revolutionary transformation in general and the Cultural Revolution in particular, all in conjunction with the voices of more than three dozen interviewees who experienced the Cultural Revolution firsthand. This four hundred-odd page book pays serious attention to “Cultural Revolution culture” and does so in a rather unique manner. In addition to a standard introduction and conclusion, the book is comprised of three parts (with two chapters each, six chapters in total), and each of these parts is identified with a human sensory organ and sense: “Nose—Smells,” “Ears—Sounds”, “Mouth—Words”, “Eyes—Images”, “Hands—Touch.” This structure highlights specific meaning-making functions of the human body, thereby helping both concretize and symbolize the author’s “sense making” efforts that aim to extend the discourse on the Cultural Revolution beyond abstract and clichéd categories and into explorations of the complex microhistories manifested in a wide-range of multifaceted cultural experiences. Even though it is not clear to this reader precisely what “smells” (and “touch” for that matter) have to do with the major arguments in the Introduction (and Conclusion), the Introduction nonetheless sets up well the book’s methodology, central argument, and lay-out. Methodologically, as already mentioned, the book is a combination of memories from a group of interviewees and of artifacts—operas, music, posters, etc.—and popular-culture texts produced before, during, and after the Cultural Revolution. Mittler argues that only by taking this approach—juxtaposing experience (from oral history) and practice (artifact)—can the Cultural Revolution begin to make sense (5). With “making sense” as part of the book’s title, the author in essence answers Han Shaogong’s call to “comprehend by reason” the culture of the Cultural Revolution. 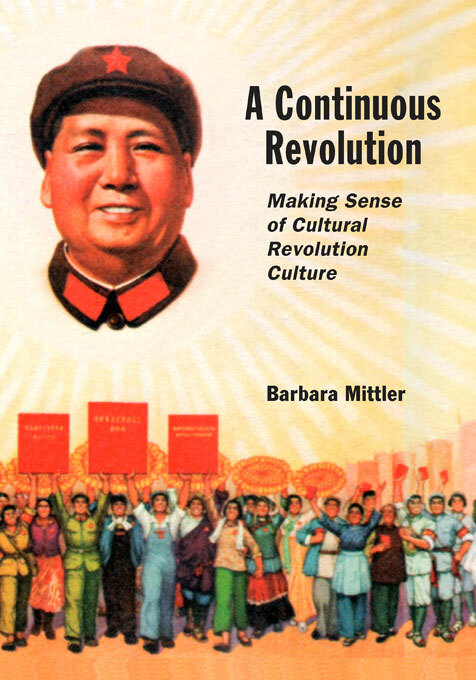 In addition to her insistence on the need to recognize the contradictory and multi-layered responses and memories of the Cultural Revolution from her interviewees, Mittler also argues for the need to recognize aspects of “continuity” in cultural production before, during, and after the Cultural Revolution, a point that she repeatedly evokes, in the Introduction (5-7, 11, 17) and throughout the book. In short, the book’s methodology—drawing from a broad palette of historical artifacts, texts from the twentieth-century Chinese revolution, (mostly Western) scholarly studies of the Cultural Revolution, as well as recorded oral responses from forty individuals—does help highlight historical happenings and personal experiences that are not reducible to either negative or nostalgic commemoration of the Cultural Revolution. As such, the Cultural Revolution as “culture,” the author argues, cannot be understood in isolation—meaning only the ten year span (1966-1976) with which it is almost universally identified—and must be understood within the larger context of China’s century-long modern revolution. It is in this spirit that the Introduction is further divided, into sections titled “Art as Propaganda,” “Art as Education,” “Art as Entertainment,” and “Propaganda as Art.” Even though the author does not bring into her discussion how “art” actually functions in the West—also as propaganda, education, entertainment, albeit in seemingly less political ways and didactic fashion—these section themes help add nuance to the notion of revolutionary art in general and Cultural Revolution culture in particular. They remind us that the Chinese revolution always recognized the important revolutionary function of art and fully explored the role of art in revolutionary practices aimed at transforming Chinese society and its people. Part I, “Ears—Sounds,” consists of the “Prologue,” Chapter 1: “From Mozart to Mao to Mozart: Musical Revolution in China,” and Chapter 2: “The Sounds Amidst the Fury: Cultural Revolution Songs from Xian Xinghai to Cui Jian.” From the titles of these chapters, one can see the “pre-” “during” and “after” connections the author endeavors to make. Chapter 1 contains a pair of “excursions,” one long (50-87) and one short (87-92), both focusing on Chinese opera [Peking opera] as “a genre of change” and on its “reform.” The author does an excellent job in her historical account of the modern evolution or changes in “Chinese opera,” dispelling a commonly encountered but specious myth that the “model works” (样板戏) destroyed the tradition of “Peking opera.” Chapter 2 focuses on the post-Cultural Revolution “parody” of the “East Is Red” (the author renders it as “Red Is the East”) and of the “Internationale.” Tracing the history of the two songs (and revolutionary music of the 1930s and 1940s), this chapter attempts to make sense of the cynical rendering of these songs in the 1980s, as represented by Cui Jian. Mittler argues for a layered reading of what she calls “the sounds amidst the fury,” suggesting that “the end of Cultural Revolution did not bring to a standstill the process of constant superscription of well-known themes, melodies, and symbols with ever-new versions of themselves” (126). While I find the first chapter a particularly rich study of the operatic reforms occurring in conjunction with the Chinese revolution and culminating in the Cultural Revolution model operas, Mittler’s discussion of post-revolutionary “sounds” remains a bit wanting. This is owing to the fact that, while she suggests that the meaning of these “superscriptions” is not always clear, she nevertheless continues to situate the “dissonant” sounds in a seemingly clear political binary opposition that pits musicians like Cu Jian against “the government,” inadvertently perpetuating a habitual and shared dichotomized way of thinking on the part of many China scholars. This reductive dichotomizing recurs throughout the book, despite the author’s concerted efforts to avoid it; she repeatedly equates the Chinese “state” (the PRC) with the “government,” conflating whoever was/is in power with the revolutionary struggles that led to the founding of the PRC as a modern nation-state. Incidentally, the flipside of the same habitual and unexamined conflation has continued to lead many China scholars to conflate anti-government dissidents with anti-China or anti-Chinese revolution sentiments, thereby significantly narrowing our understanding of the complexities raised by the presence of oppositional voices. Part II, “Mouth—Words” is likewise divided into a Prologue and two chapters, Chapter 3: “Destroying the Old and Learning from Black Material: The Political Fate of a Famous School Primer,” and Chapter 4: “The Foolish Old Man Who Moved the Mountains: Superscribing a Foundational Myth.” Chapter 3 essentially focuses on Sanzi jing 三字经 (Three character classic) and the various revolutionary “primers” composed in the same three-character-line form. Mittler’s uncovering of a range of new revolutionary sanzi jing is impressive. On the whole, however, she does not make it altogether clear what the relationship is between the use of the sanzi jing form and of the traditional Sanzi jing (other than it being an convenient way to popularize dominant ideas and values). Even less clear is the focus on the Criticize Lin Biao and Confucius (批林批孔) campaign in this chapter, except perhaps to indicate that, contrary to the campaign’s intention, it in fact generated popular interest in Confucius (a further example to complicate the simplistic understanding of the Cultural Revolution in general and this specific political campaign in particular). Chapter 4 is an exceedingly long chapter on what the author calls the “superscribing” of the “foundational myth” of A Foolish Old Man Who Moved the Mountains (愚公移山). The myth of course refers to a well-known anecdote by Mao Zedong about the difficulty and possibility of constructing socialism (although it is quite a stretch to call it a “foundational myth”). “In tracing the history of one Mao quote from the Little Red Book,” the author states, “this chapter asks: How powerful was (and is) it? To what extent were performances of Maoist communication genuine? . . . And what role does the story play before, during, and after the Cultural Revolution?” (195). The last question here indicates that this is essentially a study of an imagined revolutionary modernity; however, it is not clear why the author chooses to focus on this particular quote from Mao. Indeed, the discussions of sanzi jing (Chapter 3) and the foolish old man story (Chapter 4) in Part II, although substantive in the primary materials uncovered, seem to stretch those materials a bit thin and creates the impression that throughout much of the Cultural Revolution period the three-word primer and “foolish old man” discourses constituted the major (ideological) “food” for the “mouths” of 800 millions of Chinese. Part III, “Eyes—Images” follows the same pattern as the previous two parts with a “Prologue” and two chapters: Chapter 5, “Mao Wherever You Go: The Art of Repetition in Revolutionary China,” and Chapter 6, “Chain(ed) Pictures and Chained by Pictures: Comics and Cultural Revolutions in China.” Here, a shift seems to take place, perhaps despite the overall attempt at broadening the scope of investigation. That is, in the Prologue, the author indicates that Part III will now concentrate on “Mao Image[s],” while the previous parts have focused on “Mao Music” and “Mao Speak,” terms not previously applied to those parts. The retroactive appellations of “Mao Music” and “Mao Speak” do not do justice to the previous chapters, nor, I might add, do they do justice to the author’s methodological approach, which seeks to avoid reductive political interpretations. In any case, Chapter 5 does indeed focuse on images of Mao, but it does so by lumping the “before, during, and after” together, making the Cultural Revolution portion of the discussion less salient. There may be some discomfort on the part of the author when it comes to presenting the various and frequently hagiographic images of Mao painted during the Cultural Revolution, because the discussion appears to be in a hurry to move on to examples of later images parodying that hagiography. Mittler tries to excavate ambiguous meanings in the images that belong to the latter category when, given the specific contexts and the target viewer of those images, there does not seem to be much ambiguity. The “Conclusion” is titled “Hands—Touch,” with a focus on “Cultural Revolution Culture and Popular Culture: Theorizing Practice and Experience.” Similar to the use of “smells” in the Introduction, “hands” and “touch” seem to have little to do with the author’s approach to the study of Cultural Revolution culture, unless, they are intended to encourage future researchers to be more “hands on” in their approaches. In discussing the “grammar and rhetoric” of the Cultural Revolution, Mittler echoes her earlier mention, in the Introduction, of Richard Kraus’s culturalist discussion of the traditional closeness between art and the state. It is not altogether clear, however, whether “grammar” is cultural or structural. The reliance on “personal testimonies,” coupled with existing culturalist claims about “the Chinese,” leads the author, via a quote from Qualter, to an ambiguous conclusion: “‘The impact and power of propaganda to produce change or maintain stability, depends less upon the professional skills of the propagandist and more on the psychological state of the audience,’” and “Propaganda is an interactive process, with response dependent upon the background of each individual. Both the audience as homogenous mass and the ‘omnipotent propagandist’ are fictional characters in a story with unpredictable outcomes” (376). In the interest of complicating the idea of Cultural Revolution culture via a plethora of concrete resources and, especially, eyewitness accounts, the author paradoxically ends up resorting to a post-modern relativism. Cultural Revolution culture, in other words, remains understudied and insufficiently understood both inside and outside of China. Regardless of its strengths and shortcomings, Barbara Mittler’s A Continuous Revolution: Making Sense of Cultural Revolution Culture is the latest attempt—and an admirable one—at offering a different take on this “unsubstitutable womb” for understanding not only the Cultural Revolution but also the Chinese revolution. For “culture” is at the core of that revolution; and the key is to understand in what ways and why that is so. [ 1 ] Han Shaogong, “Why Did the Cultural Revolution End?” boundary 2 35, 2 (2008): 104. Chinese original appeared in 2005.